Emamidesign USB Clip is a 2010 Red Dot product design Best of Best award winner for its colorful usb flash drives and clip design concept. 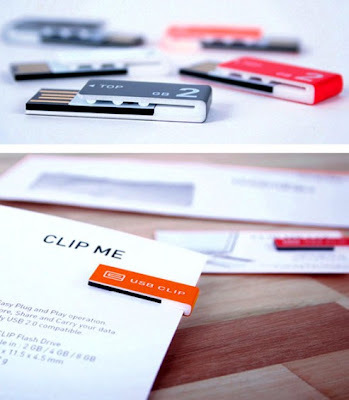 You could clip the usb flash drives to your books, journal, office reports, letters, virtually any paper type of stuffs. For the time being, Emamidesign USB Clip is still a concept, no info when it will be mass produced.